The process that writes the dirty pages from the system memory (RAM) to the disk is called the checkpoint process. Dirty pages consist of the data and log pages as well as the information for the transaction log. Detailed information about the checkpoint can be found here. Indirect checkpoint was introduced in SQL Server 2012. It combines designs from previous checkpoint implementations which you can find in the reference Indirect Checkpoint Default of the “It Just Runs Faster” series. “Indirect checkpoint is the recommended configuration, especially on systems with large memory footprints and default for databases created in SQL Server 2016” informs that it’s becoming the default for the SQL Server 2016 databases. The reference helps you understand the Target Recovery Time (Seconds) option. You can find the option for a database in the Properties window under Options as well as in the Create New database window in the Options too (Figure 1). Figure 1. Target Recovery Time (Seconds) option set to 60 by default in a Create new database window in SQL Server 2016. 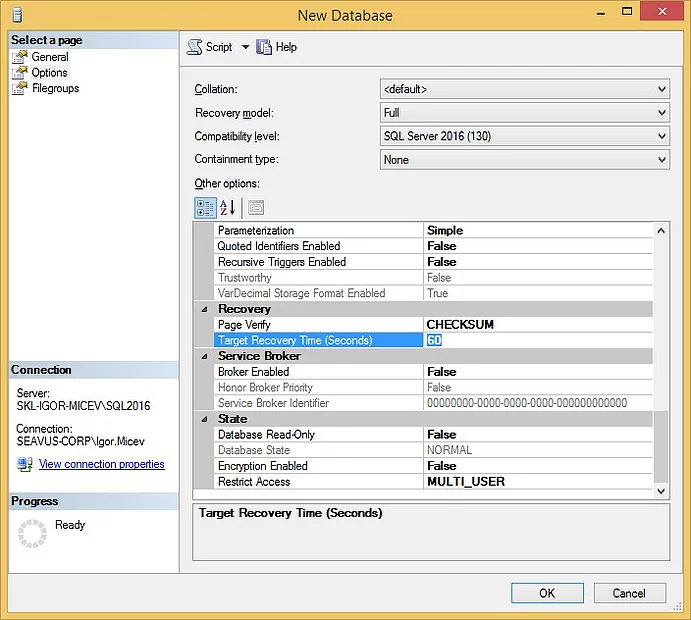 For example the same Create new database window in SQL Server 2014/2012 looks like in Figure 2. Note the highlighted value here is different, with a default value of zero (0). Figure 2. Target Recovery Time (Seconds) option set to 0 by default in a Create new database window in SQL Server 2014. If the Target Recovery Time (Seconds) is set to zero (0), it means that the database uses automatic checkpoint. By setting a value greater than zero (0), the new, indirect checkpoint will be used. In other words, the setting value for TARGET_RECOVERY_TIME from Figure 1 (highlighted value 60) will use an indirect checkpoint. If it’s set to 0, it’s going to use the server level configuration ‘recovery interval (min)’ in sys.configurations. If in Figure 1, TARGET_RECOVERY_TIME is set to zero (0), then the indirect checkpoint will be replaced with the automatic checkpoint. Following the same analogy, if in Figure 2, for the SQL Server 2014 Create new database, I set a different value from zero (0) for TARGET_RECOVERY_TIME, then the indirect checkpoint is going to be used. You can see the setting configuration at the database level with the next query. You can change the interval with the following command. The setting reconfiguration takes place immediately without the need of restarting the instance. It’s good to also check the setting on server level. Value of 0 means one (1) minute of recovery interval time. The setting TARGET_RECOVERY_TIME set to 60 seconds does the same checkpoint interval, but uses the indirect checkpoint algorithm. The TARGET_RECOVERY_TIME setting made me curious about the performance improvement I wanted to see on my database environments. I changed it on two staging environments and run tests. I set the recovery time interval to 60 seconds. My staging environments have shifted real-time live feeds of the ones on the production environments so that I can say the tests on staging are very relevant for my production environments. The current instances I used (24 cores, 128 GB RAM, 500 GB data), have 50+ databases, all of them with sizes between 5 – 10 GBs. The version of my SQL Server instances is 2014 (120). I changed the TARGET_RECOVERY_TIME from value 0 to value 60 (seconds). I noticed an improvement for the CPU usage for the tests on the two staging environments. The tests were done under equal conditions. The overload is/was constant and not changing during the testing period. Next Figure 3 shows the CPU usage measured by the perfmon.exe tool on a 600 seconds duration. Figure 3. Measuring the CPU usage with the default value (0) for TARGET_RECOVERY_TIME on an SQL Server 2014 instance. Then I made the change for all user databases. I run this query to generate the ALTER commands because I have tens of databases. and then run the commands one by one. The commands run fast on my environments. After changing the setting on all databases I run the perfmon.exe tool again and got the following Figure 4 for the average CPU usage. Figure 4. Measuring the CPU usage with the changed value (60) for TARGET_RECOVERY_TIME on an SQL Server 2014 instance. I got a decreasing of the Average CPU usage from 25.347 to a value of 23.522 measured on 600 seconds duration, which is around 8% improving. The CPU usage remained lower for about 2% after the new set up for Target Recovery Time. I made a series of 5 measurements for the average CPU usage in different periods of the day. In all measurements the average CPU usage was lower, ranging from 2 – 2.5% of decreasing. In the beginning of this article I mentioned that I’m going to use “light” environments with small databases, but numerous of them. Even though the setting is strongly recommended for the “heavy” environments, it also shows improvements for the ordinary, relatively small as well. Any improvement is welcome. This entry was posted in Features, Optimization and tagged configuration by Igor Micev. Bookmark the permalink.